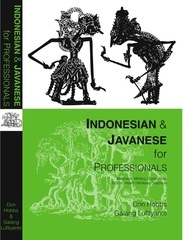 Indonesian & Javanese for Professionals: Business, Military, Government, NGOs, Health Workers, Teachers. A unique text for those who already know some basic bahasa and want to improve it or are learning Javanese. Arranged by topics, with comprehensive vocabulary lists in English, Indonesian, and Javanese. 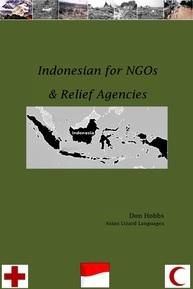 Also, language & cultural notes, realistic short conversations, receipts, hand-drawn maps, diagrams, organizational charts, and an A-Z glossary of Indonesian abbreviations and acronyms. A must-have reference. 395 pages. PDF is now FREE! Download it by clicking on the link below now. PDF e-version, use Buy Now button below (Paypal) = $10! is a text that addresses topics like medicine, NGO operations, natural disasters, civil affairs, village life and organization, building and repair, and more. Individual topic-based units include vocabulary lists, language and culture notes, various reading samples, and short conversations. 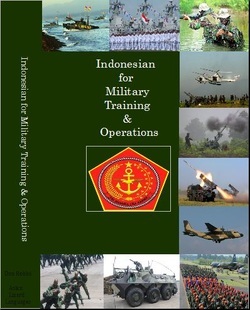 A must-have resource for anyone working in this field in Indonesia. Do you already know some Thai? Want to learn Lao? 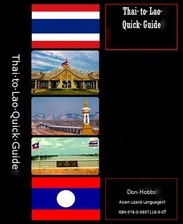 If so, this guide gives you all you need to know to start speaking Lao today, and makes a great reference. 17 pages. An integrated skills text designed to be completed with the help of a tutor/partner (in-person or online), and help you function in both formal polite (krama) and informal (ngoko) Javanese. There are 3 main topics: greeting & meeting people, buying & bargaining, and getting to know someone. Javanese pronunciation and grammar basics are clearly explained in detail. On your own tasks done online help you review and apply your skills.